Medicolegal Aspects of Marijuana: Colorado Edition, published by Lawyers and Judges Company in 2015, is your go-to resource for understanding marijuana and Colorado law. 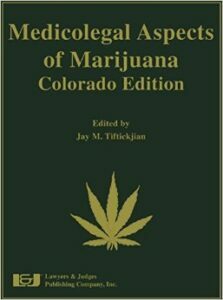 Edited by attorney Jay Tiftickjian, Medicolegal Aspects of Marijuana: Colorado Edition offers a wealth of information from some of the most prominent experts in the U.S. on issues surrounding both medical and recreational cannabis. Contributing writers include Sean McAllister, Andres R Guevara, Leonard Frieling and Jeffrey Gard, among many others.